Shaylin and Berto. 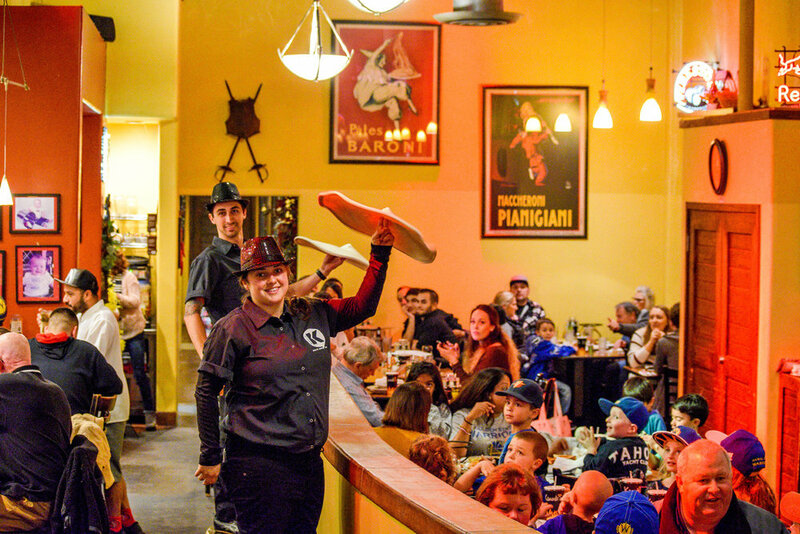 Our pizza spinners perform every Friday and Saturday Night along with our servers. Stop by and say "Hi" to our spinners. Ten years ago Roberto walked into Kianti's and says his life changed forever. He started out at Kianti's as a mild mannered server! Roberto participated in the weekend shows with the servers, but he claims of having two left feet and had to double the dance practices just to keep up with the routine. Entrigued by the dough spinning theatrics of Justin Wadstein and Jay Shuurman (previous pizza spinners) he knew he had what it took to become a contender. It took six months of diligent practice on his own time until he was deemed show worthy. Since then he has enjoyed doing the shows on the weekends. It's always a treat to see the awe on everyone's faces. Roberto has been our lead pizza spinner for many years, and has played several holiday characters, including Santa. You can catch Roberto almost every Friday and Saturday night performing at Kianti's, as well as many Santa Cruz Warrior's games during the Kianti's Pizza Dash. Shaylin started working at Kianti's 2012 and loved doing the Friday and Saturday night performances, right from the start. She performed as a dancing server for a few years, but always showed interest in learning how to toss dough. She would practice almost every night after work until she felt confident enough to perform as a pizza spinner. That was 3 years ago, and since then, Shay, has been our only female pizza spinner, playing the part of Mrs. Clause for some of our holiday shows. You can also see her at a few Santa Cruz Warrior games performing dough-tossing tricks during the Kianti's pizza dash. Our entire staff is part of the show including our chefs! It's a family affair and quite a show. Every year from Thanksgiving weekend through the new year, a holiday show is created and performed every Friday & Saturday Night. The owners each have two children and through the years the holiday theme changes and their kids are added into the performance playing chipmunks, toys, bakers, etc while dancing, singing, and spinning dough. It has become a holiday tradition for some of our customer's families to come and see the show. During this time we are told they look forward to a new theme and watch the kids grow through the years.